In May, the 2016 Northwestern Hawaiian Islands marine debris removal mission came to an end, successfully hauling in 12 tons of debris from Papahānaumokuākea Marine National Monument. A marine debris team of 10 NOAA scientists was part of the removal effort that spanned 32 days cleaning Midway Atoll National Wildlife Refuge, Pearl and Hermes Atoll, Kure Atoll State Wildlife Sanctuary, Lisianski Island, and the French Frigate Shoals. 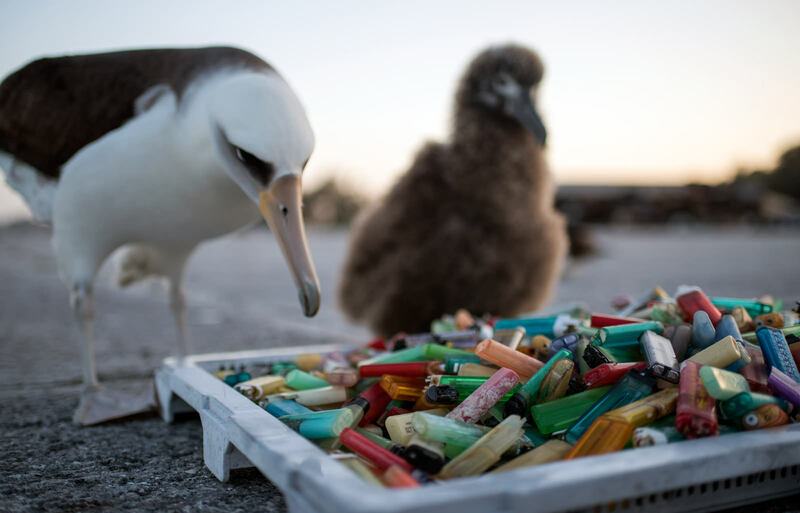 In this image, a Laysan Albatross looks curiously at a pile of disposable cigarette lighters. These were part of the 535 cigarette lighters collected during this year’s mission.